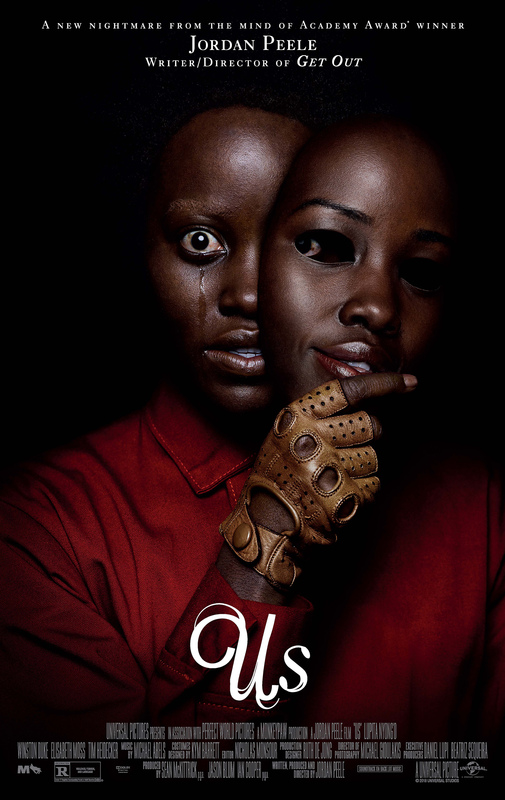 Everyone’s talking about Jordan Peele’s new movie Us staring Lupita Nyongo (Queen of Katwe, Non-Stop, Star Wars: The Last Jedi) and Winston Duke (Black Panther, Avengers: Infinity War). So, let’s talk about it! Lupita plays Adelaide Wilson a loving mother with a traumatic past. One night during her childhood she wandered off onto a hall of mirrors ride and came face to face with…herself. Literally. No, I mean literally, literally! Like no mirror tricks whatsoever! This left a deep fear in Adelaide that kept with her well into her adulthood. When she and her husband Andrew, played by Winston, take a family trip near the very same place Adelaide met her double her fears begin to grow more and more. Finally, unable to keep her unease at bay Adelaide tells Andrew about the incident from her childhood and relays to him that she feels her double may be coming back to get her. Of course, Andrew does the normal thing and laughs off her worries with the usual over emasculating “Don’t you worry hun’. If any monsters come out, I’ll protect you.” BS. Then it all starts with a simple line from their son informing. “There are people outside.” And suddenly Adelaide is met once again with her doppelganger as well as a copy of every member of her family. From there we get the creepy story we’ve been waiting for as the Wilsons fight to stay alive as their doubles aim to kill them off one by one. So, this is a movie I can get behind. It’s creepy, Peele once again shows off his skill behind the directors’ chair and we get some nice and sinister food for thought by the time the movie ends. I loved this movie for the visual fright it gave us. The way the doppelgangers move. Their wide-eyed stare. How they communicated and the fact that your own worst enemy seemed to be a twisted version of yourself. I found the idea behind this entertaining. But when I said earlier that people are talking about Us this isn’t what I meant. Unfortunately, the elephant in the room for this film is the gigantic plot hole that you can herd a stampede of elephants through. I won’t go into too much detail for you but if you’ve seen the movie you know what I’m talking about. It’s super hard to miss. If you haven’t seen the movie let me give you some hints: Throughout the entire movie we never really receive a clear answer as to how the clones came to be. How they remain hidden in their underground world (Which seems super easy to get to). And why they choose to stay in this underground world mimicking (and sometimes not mimicking) their counterparts. It seems to be that even with all the creepy-cool visuals if the story you are trying to tell keeps making people say ‘Why?’ It’s all for naught. Rated R for violence, terror and language. Rotten Tomatoes currently have this film at a 94%. Mmm smells fresh! I enjoyed the movie and I think it’s worth the watch. If you just want something scary and fun, this would be it! However, just know it’s a movie designed to make you think and you’ll most likely come out with more questions than you had when you first went in. A pretty chilling film I must say. Nice review.